After Hurricane Matthew, many Hatteras Island residents relied on donations from the local food pantries. This, added to the fact that some residents have a harder time finding employment during the winter months, and food pantries are in still in need of supplies and donations. 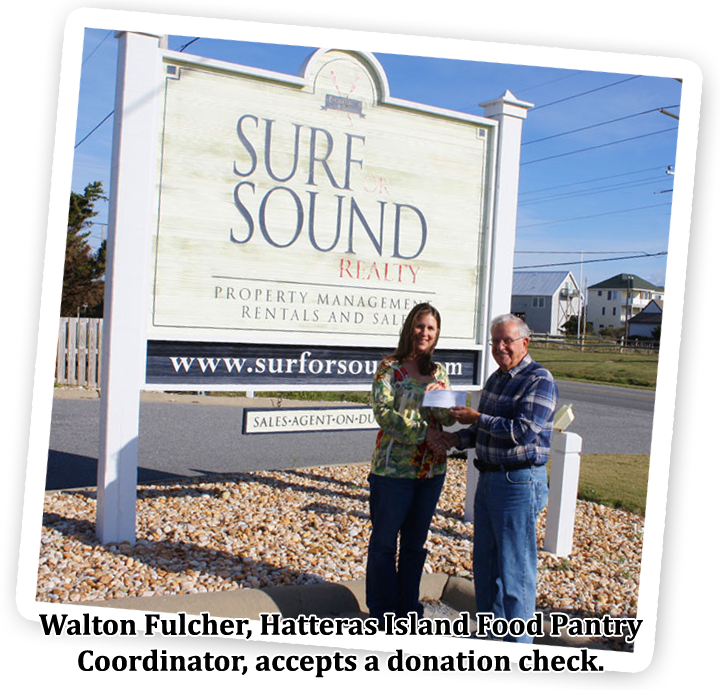 Surf or Sound Realty collected 308 pounds of food to donate to the local pantries and matched the food donation, dollar for pound, with a check for $308 to the Hatteras Island food pantry to help residents in need get through the winter months. 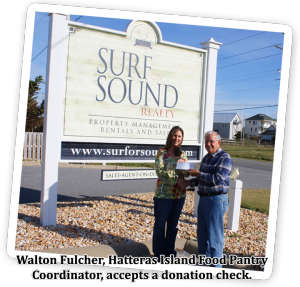 Hatteras Island Food Pantry is a community-wide organization that helps families on Hatteras Island with emergency assistance. 100% of donations are used for this purpose. 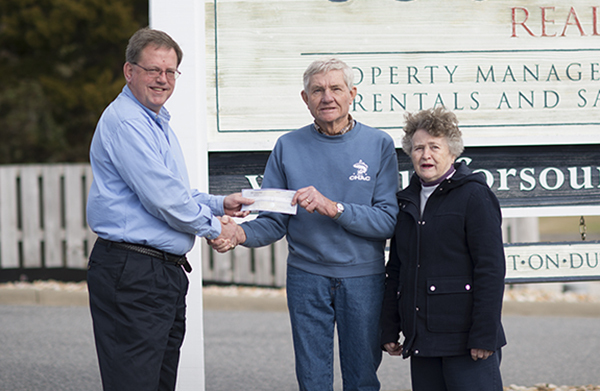 “We wanted to do everything we could to help the community and thought that by announcing our matched monetary donation we might increase participation this year, it worked!” said Ann Wood, Vice President of Marketing for Surf or Sound Realty. 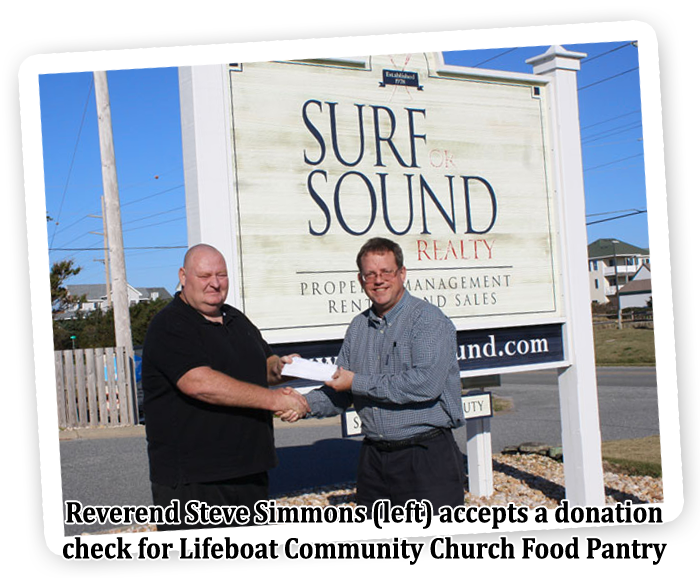 Surf or Sound Realty’s Avon and Salvo offices also serve as year round drop-off locations for local food pantries. Weekly rental guests are encouraged to donate any unopened non-perishable food at the end of their stay, and many are more than happy to help. 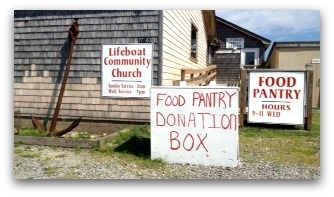 Monetary donations for the Hatteras Island Food Pantry can be made payable by check to United Methodist Men and mailed to Hatteras Island Food Pantry, PO Box 1591, Buxton, NC 27920. 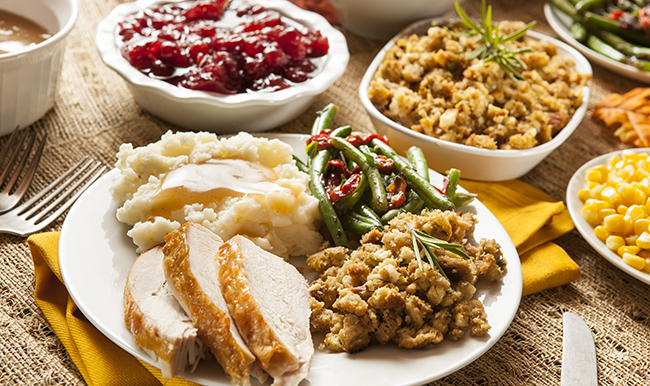 We’re nearing the time of year when we begin to think especially of nourishing food and giving thanks. We are always grateful for our generous guests, who, throughout the year, donate a TON of unopened non-perishable food to our lobby donation box for our local food pantries. It’s not just one or two cans a week, nearly a third of our guests donate items ranging from canned goods to bags full of items and supplies. The island’s food pantries continue to need our support during the colder months, and as we have done in years past, our Salvo and Avon offices will serve as a drop off for Hatteras Island’s Holiday Food Drive. Donations from staff, neighbors and island friends will all make a difference in feeding those in our community who might otherwise go hungry during the slower winter months. 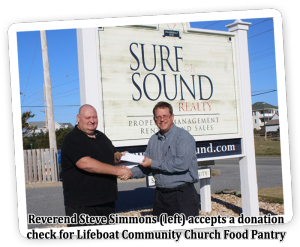 Donations made to our Salvo office on the corner of Highway 12 and Rampart Street will go to Lifeboat Community Church Food Bank and those made to our Avon office across from the Avon Fishing Pier will go to Hatteras Island Food Pantry. Thank you for not only visiting our island, but taking time to be a part of the community by helping to sustain those who live here. 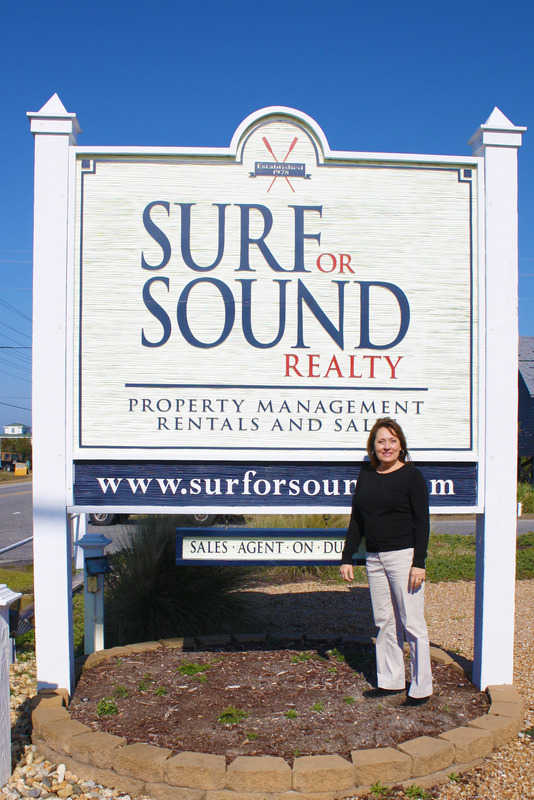 Surf or Sound Realty is pleased to announce the addition of broker Deanna McDaniel to their dynamic sales team. “We are excited to have Deanna as part of our real estate sales team. Her background and expertise is a great fit for our organization and will serve our clients well,” says Melvin Stone, President of Surf or Sound Realty. McDaniel, who has lived on Hatteras Island for 13 years, currently resides in the village of Frisco and has a daughter, Rachael, who attends East Carolina University in Greenville. McDaniel secured her real estate license in 2001 after 20 years of owning her own successful business and assisting her late husband, a general contractor, with his business endeavors. “I have spent a lot of time in the building business,” states McDaniel. McDaniel has worked as a broker since obtaining her license in 2001 and proudly promotes Hatteras Island real estate. In 2012, McDaniel obtained a Certified Distressed Property Expert designation and serves as a short sale/foreclosure resource. Deanna McDaniel can be reached in our Salvo office at (252) 987-1444 x115 or deanna@surforsound.com. With the first day of summer upon us, we were ecstatic to hear that the U.S. House of Representatives passed H.R. 4094, a bill to restore reasonable access to the Cape Hatteras National Seashore Recreational Area. The bill, introduced by our Congressman, Walter Jones, was approved yesterday, June 19th, and passed in a 232 to 188 vote. H.R. 4094 was included in a package of bills grouped together under H.R. 2578, known as the Conservation and Economic Growth Act. The bill proposes the reinstatement of the Interim Management Plan that was in place prior to the restrictive consent decree and ORV Rule implemented by the National Park Service. We can’t get too excited yet because before this can occur, the companion bill in the Senate needs to pass and then President Obama needs to sign it. The 2008 consent decree imposed rigid and severe beach access restrictions that have hurt the local economy and limited the Superintendent from utilizing an active managment approach that would better help wildlife at the seashore. A companion bill has been sponsored in the U.S. Senate by Senator Richard Burr and Senator Kay Hagan. Senate bill 2372 will be the subject of a Congressional hearing next week. We are very grateful to our Congressman, Walter Jones, and all of you who have exerted time and energy to this cause. Thank you! 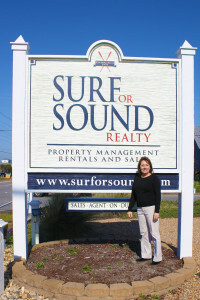 Surf or Sound Realty is set to man Mile Marker 25 once again for the 6th Annual Outer Banks Marathon. It will be held November 13th with more than 5000 runners from all over the country and world running and walking the 26.2 mile stretch of beautiful scenery from Kitty Hawk to downtown Manteo on Roanoke Island. Mile Marker 25 is near the finish line, and volunteers from Surf or Sound Realty, along with their friends and family, will encourage all of the runners and pass out water and Gatorade to the marathon participants. We have created signs with encouraging statements on them that we will post leading up to our station, and the signs will be paired will pink flamingos! You can rent 12 pink flamingos for a minimum donation of $25 and the funds go to Hatteras Island Meals. HI Meals is a non-profit organization staffed by volunteers that delivers a hot meal to nourish and enrich the lives of homebound and other people in need in every village on Hatteras Island. The Outer Banks Marathon is one of the events organized by Outer Banks Sporting Events (OBSE). The mission of OBSE is to organize and promote sports competition and healthy living resources, provide financial resources for needed relief and support for education while contributing to economic development for the Outer Banks of North Carolina. 100% of net proceeds are split 50/50 by the Dare Education Foundation and the Outer Banks Relief Foundation. 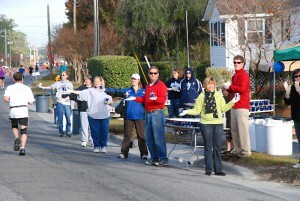 For more information on races and sporting events on the Outer Banks throughout the year, visit www.obxmarathon.com.